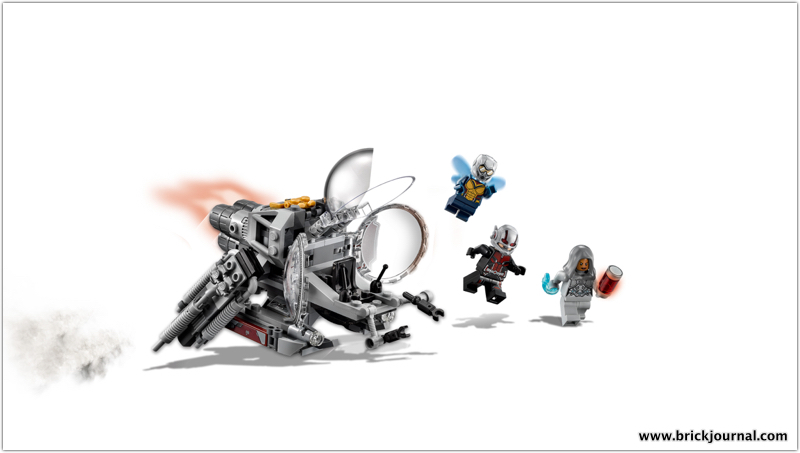 Includes 3 LEGO® Marvel Super Heroes minifigures: Ant-Man, The Wasp and Ghost. Quantum Vehicle features a bug-eye-shaped, opening minifigure cockpit, 2 adjustable insect arms, 2 stud shooters, 2 adjustable engines and 3 mufflers. Adjust the engines for launch, flight and hover modes. Weapons include Ant-Man’s Shrink Gun and Ghost’s 2 Power Blasts. Accessory elements include a gold-colored trophy and the Wasp’s wings. Ghost minifigure is new for June 2018. Recreate thrilling scenes from the Marvel Super Heroes Ant-Man and the Wasp movie. Quantum Vehicle measures over 2” (7cm) high, 5” (15cm) long and 3” (9cm) wide. Available June 1, 2018 at the LEGO Brand Retail Store and other retail outlets! ← Take a Ride With the Ultimate Roller Coaster!